As teams continue to confirm plans for their 2017 campaigns, Team Koene USA is pleased to announce the arrival of Jeremy Fairbairn to their elite level karting program. Set to join the Indiana based team at the upcoming MAXSpeed Collective Test, Fairbairn will also pilot a Team Koene USA Tony Kart throughout the upcoming 2017 season in some of the nation’s biggest karting programs. A front runner in the Florida karting scene, Fairbairn is a former World Karting Association (WKA) Manufacturers Cup winner, a podium winner in in ROK Cup USA competition, a multi-time race winner in Micro MAX and Mini MAX at the Florida Winter Tour and a front runner in other Rotax MAX Challenge programs throughout the United States. 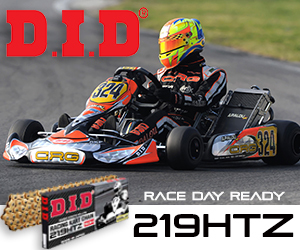 In 2017, the 12-year-old Floridian will compete on the national stage as he will see action in the MAXSpeed Entertainment promoted Florida Winter Tour (FWT) ROK Cup USA and Rotax programs as well as the US Open series. Fairbairn will also compete in the SuperKarts! USA (SKUSA) Pro Tour, United States Rotax MAX Challenge Grand Nationals (USRMGN) and the prestigious SKUSA SuperNationals as he will see action in IAME, ROK and Rotax powered divisions throughout the season. Koene USA’s karting program is an elite level program for drivers looking to excel on the national karting scene. There are multiple programs offered, including arrive and drive as well as tent and transport. There are driver coaches and engine builders on site to ensure drivers receive the help they need at all times during the event. Koene USA will be testing both days of the Winter Collective, as well as on Friday, December 16. If you are interested in participating in the Winter Collective testing with Koene USA, or are interested in running the 2017 Florida Winter Tour with the team, please contact Mike Maurini at 317.270.8723.